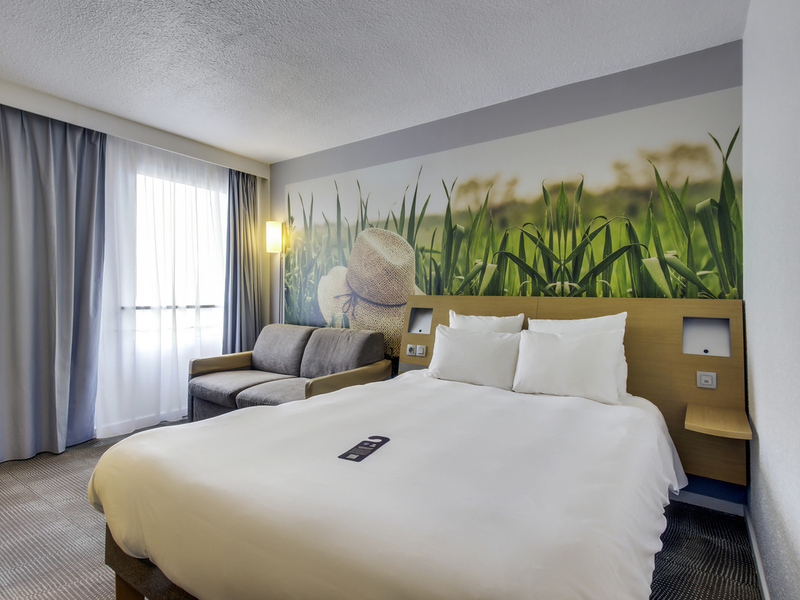 The Novotel Paris East hotel's ideal location on the outskirts of Paris gives easy access to the lively République and Bastille districts. Metro line 3 is a two-minute walk from the hotel and takes you directly to Opéra and the Parisian department stores. Easy and direct access from international airports. If you need it, don't hesitate to take advantage of our covered private car park. I selected this hotel as close to the office in Bagnolet. Room: standard at Novotel. Fine. Breakfast: poor quality in respect of similar Novotel. I found dishes and cups not well cleaned or chipped. Yogurt was with expiration date of the day after. Many tables left unserved, with dirty cups for long time, reducing the availability. Dinner: awful, low quality products, poor preparation, no value for money. I ordered a classical Chicken Caesar salad. Dressing appeared watered (maybe lettuce was not well dried), chicken breast was boiled not grilled, poor Parmesan and lettuce. Shower didn't work properly. Toilet and bath both were very old. The rooms were not looking modern. Receptionists not talking English well..Air condition not working in all floors..No response after reporting at the reception many times..
Room quite old and wear off (especially a light carpet was really terrible looking). Breakfast very poor, just a few choices and pretty crowded. Check in process very slow. Requested room on the same floor because we had to book 2 rooms for 5 people, no room available to for whole family in, and whole check-in process took us about an hour until they were able to change the rooms to our needs as requested at the time of booking it. It's very strange to see totally different levels of services and accommodation in different Novotel hotels. It is not easy to recognize difference upfront. Friendly staff, clean, and comfortable. Somehow I don't feel that it's a four star hotel. Little bit disappointed for no family pool for kids. Bathroom supplies were not provided enough so we used our own's. I stay at the hotel every two weeks. My stay is worse each time. The workers at the reception are not competent. Once again, it took more than 20 minutes for the check-in. They did not find my reservation. I have the gold status as I am member of the Accor club. They never find my card member. Let me remind you that I stay 2 days in this hotel every two weeks since more than two years !!! We are now looking for another place to make our meetings and book rooms. The hotel has decided to choose to work with big groups. For the others clients, there is no service anymore. After the issues we had mast year at this hotel, this year everything was well managed. Clean room, good service. Dear N. A., We very much appreciate your comments regarding your stay at the Novotel Paris Est. It is always a pleasure to receive positive feedback. I will share your comments with our team. I am sure that this feedback will serve as an encouragement to all of our staff as we strive to continuously improve the quality of our services. Thank you again for sharing your experience, and we hope your next visit will be as pleasant as the previous one. Sincerely, Aissata Sow Guest Relation. The hotel is always good. The new menu in the restaurant was a great surprise. Although, my friend was disappointed that mac and cheese was discontinued. I did not receive hair conditioner in my room and so, I had to go and buy some. The one small bottle of shampoo that I was given, lasted me the visit. Good. Breakfast hours end at 9:30 A bit too early for people on holiday. Front desk Staff not well trained. For the drinks offered, the bartender did not know which drink she can give us so we only had coffee instead of what we wanted. Staff need training in customer service. It was bad, we were moved on last day of our stay to different hotel and the hotel we moved in was not good and we had to waste our time to argue with hotel staff and pay some extra amount as well. Overall indifferent service and quality. Check in took too long. Room was big for Europe but dingy. Food options were terrible. Scrambled eggs at breakfast were almost raw and inedible. Having to boil you own eggs is not efficient and takes too long. Dinner options in the restaurant were not great and tasteless. No restaurants available that were safe to walk to near the hotel. Service and hotel infrastructure was really poor. Front desk does not help at all and even you have a problem like noise at night, they don´t do anything. It is said to pay for nothing.I will not stay in this hotel anymore. Very bad service, poor cleanness, unpolite staff. no iron in room, had to search for ages to find the small room with it in! (Never experienced this at a hotel before!) had to queue for ages upon arriving to check in, whilst many staff were behind the desk talking to each other but not to guests. There was no shower gel in the shower. The bath was damaged/old. IN the restaurant the service was terrible and slow. Need I go on?! Was very dissatisfied about the fact that I had to pay up front for hotel stay and could NOT amend hotel reservation. Also, could not set up an account because stay was 2 days and therefore could not order food to the room.